Chief among the new features in Transkoder 2014 are a brand new, easy-to-use user interface, a multi-track timeline, EDL conform editing tools, support for subtitling, automatic watch folder processing, plus extended support for CinemaDNG, R3D, ARRIRAW, F65/F55, Canon C500 and Phantom camera formats, and deliverables including DCPs, IMF AS-02 and HEVC. BUDAPEST, Hungary, Aug. 7, 2013 – Academy and Emmy Award-winning developer Colorfront (www.colorfront.com) will underline its reputation as an industry-leading technology innovator as it previews performance-boosting advances for 4K and Ultra High Definition Television (UHDTV) production and post production, across the 2014 versions of its On-Set Dailies, Express Dailies and Transkoder products at IBC 2013, Amsterdam, 13-17 Sept (c/o AJA 7.F11, Tangent 7.G33 and Sony 12.A10). Colorfront On-Set Dailies is the most widely-adopted on-set dailies processing system, used by elite Hollywood production suppliers, blockbuster motion pictures and high-end episodic TV shows. With On-Set Dailies 2014, Colorfront ramps-up performance with the introduction of accelerated CPU and GPU processing of HD/2K/4K video via NVIDIA's latest Quadro K6000, Tesla K20 and GeForce GTX Titan cards, plus support for AJA Corvid Ultra with simultaneous HD/4K/UHDTV high framerate (HFR) video output. On-Set Dailies 2014 sports an improved grading toolset with new primary and selective grading tools, the introduction of masks and curves, with mapping for third party control panels, such as those from Tangent. Playback and review tools are significantly enhanced with new timeline and editing features, plus extended Bin and Lookstore functionality, enabling users to rapidly search for, organize and manage media for an entire TV or feature production. "Digital high-end features and episodic TV shows rely on Colorfront dailies systems because of their superior performance. They cost-effectively streamline camera-to-post and VFX workflows, and ensure the integrity of color pipelines and associated metadata," stated Colorfront managing director Aron Jaszberenyi. "The latest advances in maximizing CPU/GPU performance, support for the latest high-end camera and deliverable formats, and significant improvements to the user-experience, will keep Colorfront at the vanguard of the marketplace." On-Set Dailies 2014 also features extended audio and video format support. This includes embedded audio on Sony F55, ARRIRAW, RED, Quicktime and MXF footage, rendering of DCPs, IMF AS-02 MXF, and support for the very latest HEVC (High Efficiency Video Coding) H.265 video compression formats. Colorfront Express Dailies is the world's simplest, high-performance, digital processing system for commercials, motion picture and high-end episodic HD television production. Express Dailies 2014 extends support across brand new MacPro, iMac and MacBook Pro platforms, and unleashes powerful parallel background rendering, using the very latest NVIDIA GeForce GTX Titan and AMD FirePro graphics cards for fast 4K video display, 4K deBayer and 4K deliverables. For VFX plate pulls, the new version also supports the export of 2K/3K/4K/5K and 6K DPX, TIFF and EXR file formats. Colorfront is further boosting the grading capabilities of Express Dailies 2014 with the addition of vignettes, gradients, effects and filters on simple grades. Other enhanced features include a new timeline user interface and editing features, LUT import/export, waveform and vectorscope, 2K ProRes output and live grading. 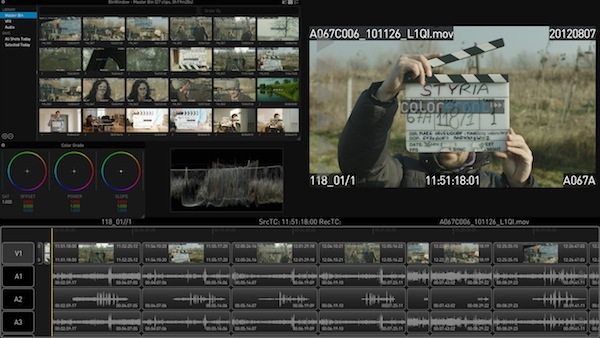 On-Set Live!, Colorfront's advanced live grading feature, enabling DITs or on-set color graders to create and manage looks, preview footage and grade on live RAW/SDI camera signals, is included in On-Set Dailies 2014 with support for external 3DLUT boxes, such as Pandora Pluto and improved burn-in capabilities for timecode, watermarks, camera and lens metadata, including color temperature, ISO, focus and zoom parameters. Transkoder is Colorfront's standalone, automated system for fast, high-quality digital file conversion, used by studios and VFX and post facilities involved in digital cinema and high-end TV production. Transkoder 2014 will be shown running on both Mac and PC platforms, online editing RAW film data, converting to various output formats, as well as color grading and rendering a range of 2K/4K/UHDTV material in various high-end delivery and mezzanine formats.